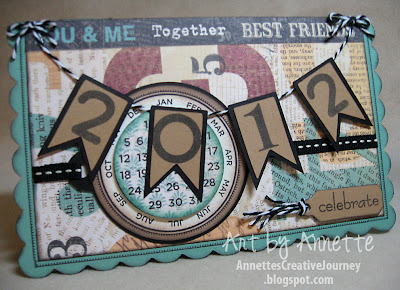 Hello and Happy New Year blogger friends! I wish you and yours a happy healthy year. I don't make resolutions but rather try to establish new & improved habits for an even happier healthier life. This year marks another year of fitness and eating well, with an enhanced focus on a leaner, trimmer me. I'll be including blog posts about my fitness inspiration and progress and welcome any helpful motivation YOU can provide too. January marks a new year, a new month and therefore a new Stamp of the Month from Close To My Heart. The set is called "Little Reminder" and is pictured in the righthand column of my blog all month long. 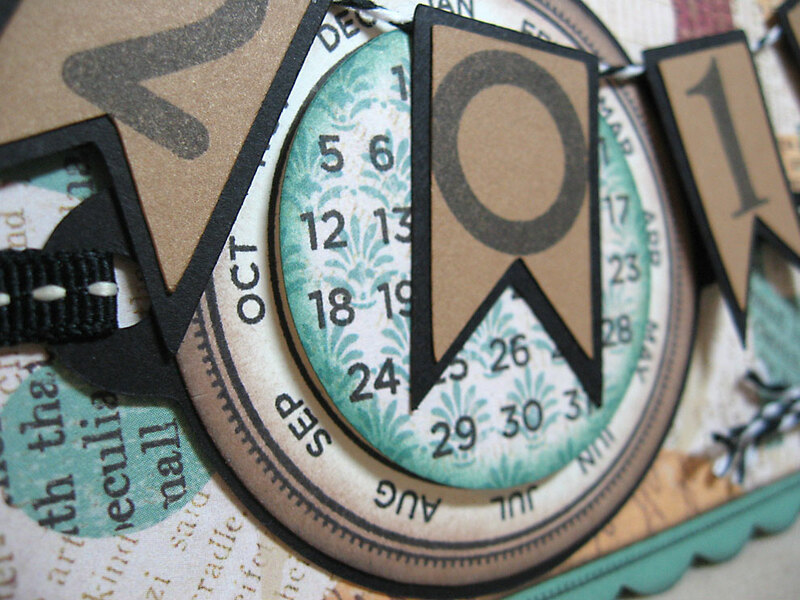 It features days of the week, numbers, phrases, and a circular month stamp that will be very versatile for many stamping projects. I like to use these types of date stamps on my scrapbook pages to mark events. Stamps of the Month are only $5 with your $50 CTMH purchase. A great deal if you're already stocking up on your scrapbooking/stamping supplies. You can shop here to get yours! The Blog Hop features over 60 CTMH consultants and will surely provide plenty of inspiration and ideas using this date-style stamp. If you're already hopping, you've likely come here from Susan Brooks' blog. At the end of my post you'll see the link where to hop to next, so let's get to it and check out the card I made for my hubby for New Year's. Using "Typeset" papers seemed perfect for a manly card and it's one of my favorites too. 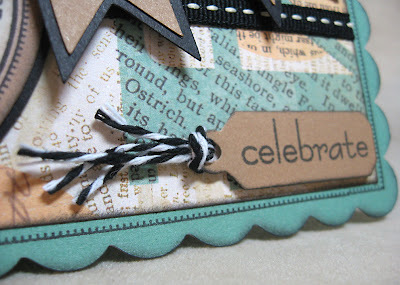 I utilized the "zip-strip" off the paper as a decorative element across the top of my card. (You & Me, Together, Best Friends). Perfect for my husband. I also took full advantage of the Art Philosophy Cricut cartridge by cutting the scalloped card shape, the circles, and the banner pieces. One of the things I like to do for added interest is stamp on patterned paper. Here I did it with the numbers stamp in Black over the Juniper leaf pattern in the circle under the banner. It just adds that little something extra rather than using plain colored card stock. Now if you'd rather not read about WHY my husband received a New Year's card from me this year, please continue on the Blog Hop by hopping over to Teresa Scrivens' blog and see what she's come up with this month. I don't normally make my husband a New Year's card but this year was special. See, our teenage daughter went away with a friend and her family for a week right after Christmas, and Paul and I had the chance to spend a lot of time together since he's been off for the holidays. Sure, we had our couple time, but what was even more special for us was just being together, enjoying the little things of everyday life with absolutely no stress or interruptions. Coffee and the newspaper, a few movies, lunch, naps, television, and time with friends. Even running errands together was enjoyable. We talk easily, we laugh, we truly enjoy each other's company. I call that true love. We get so busy (all of us) and caught up in daily stresses, we don't realize that we might be neglecting one another, so when we get the opportunity to simply enjoy, it's an extremely pleasant surprise. It felt like we re-connected. And it's been one of the happiest weeks of my life. So that is why my husband received this card from me this year. Inside I wrote everything I just shared with you. Our daughter comes home tonight and I am very much looking forward to seeing her again. She's my best friend and sometimes worst enemy at times, as most teenage daughters and mothers seem to be. But she's a pretty fantastic person and I have truly missed her. Here's hoping you have a Happy New Year filled with life's simple joys, and opening your eyes and soul to them each and every day. 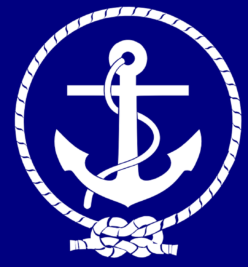 Love your 2012 pennant! May this year be the best ever! Love your card and I especially like the pennants. I'm so happy to read your story about your time alone with your hubby (give me hope) :) and I hope you dd arrives home safe and sound. What a neat card! I love all the layers and the banner. What a great way to start 2012! Congrats on being chosen by Tim. You do have an awesome blog! Congrats on your win over at Tim's blog! Have fun shopping for new goodies! I've visited your blog before (following you from ATT), but never left a comment. I really love your New Year's card. 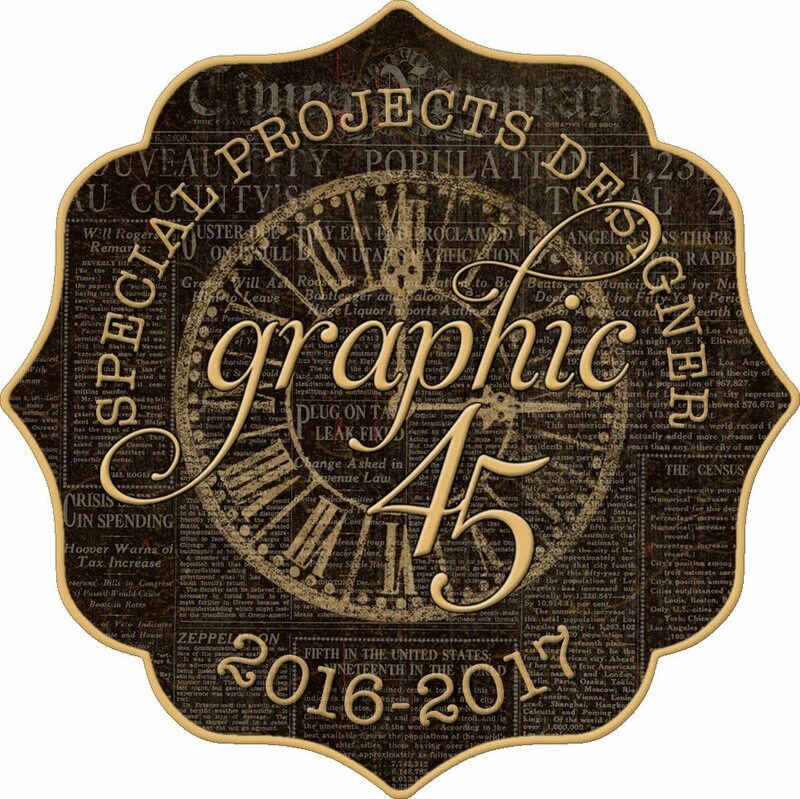 And the Graphic 45 mini album you made for your friend Lisa is just absolutely beautiful! Thanks for sharing! Love you new banner but then I really liked the old one too! WTG prize winner you so deserve it! Beautiful work!!! Love that banner...lol!!! Congrats on the win today...happy new year!!! Wow! Thanks all for the comments and for being so sharp on the win. I just received a phone call from my friend Laurie telling me to check Tim's blog. Very exciting! I've been so busy messing with my own blog changes, I almost forgot to check Tim's this morning. Wahoo! You ought to teach a class on how to decorate cookies. There must be a secret to your frosting and technique. There's no way I could do this. So cute! Congrats on being chosen by Tim! Great card! Especially love your pennant! Awesome! I'm scraplifting this one! Great job! I wanna be you when I grow up! Awesome card. Love the detail of stamping the numbers on B&T paper, really adds extra dimension. Congrats on win! Oh, what a fantastic card!! Definitely one that I will want to CASE! Thank you so much for sharing!! It is so easy to 'take advantage' of our spouses, and the fact that they will 'always be there', it's good that you were able to have the time to just enjoy each other! Congratulations on getting a Tim Win! From the looks of your work, you certainly deserve it! BEAUTIFUL card! 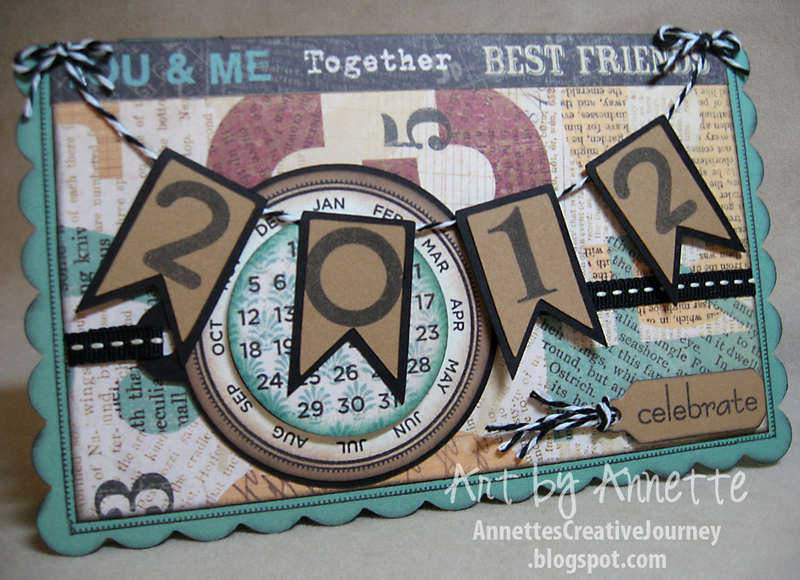 Love how you layered the pennants, how you stamped the numbers on designer paper, and the list goes on :) Amazing!!! TFS! !